The Southbank Centre was the setting, in July 2012, for an exhilarating weekend of new music commissioned as part of the Cultural Olympiad. All twenty works of the New Music 20x12 project were performed during the course of the weekend, using all available spaces and there was almost a carnival atmosphere as thousands of people attended a huge variety of events around the centre. 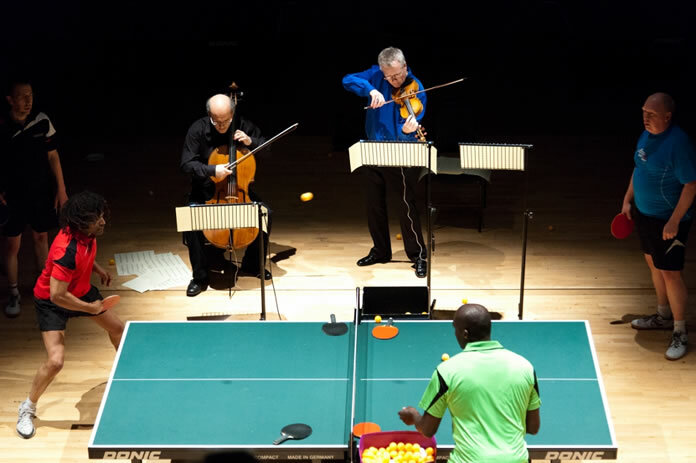 We performed ‘Ping!’ three times in the foyer of the Queen Elizabeth Hall, and members of the Quartet, Fusion Table Tennis Club, composer Joe Cutler and artist Tom Dale took part in a short discussion hosted by Radio Three’s Kevin Le Gendre. Before the third performance we were delighted to welcome an orchestra of young string players from Lewisham’s Fabulosity project and the Pembroke House Community Music Project and join with them in a performance of ‘Cutlets of Ping!’, a work we had commissioned from Sean Clancy, which he had conceived as both a response to Joe Cutler’s music and also an introduction for the children to the extended string techniques which Joe has used in ‘Ping!’. View the University of Warwick’s video article about Ping! View Nylon Film’s video of the Southbank Centre event. We were delighted and proud to celebrate the London 2012 Cultural Olympiad through our participation in New Music 20x12, PRS for Music Foundation’s New Music UK-wide commissioning programme initiated by Jillian Barker and David Cohen, delivered in partnership with the BBC, LOCOG, Sound and Music and NMC Recordings. Composer Joe Cutler was awarded a prestigious New Music 20x12 commission and his new work, ‘Ping!’, scored for string quartet and table tennis players, also features a video installation in collaboration with the artist Tom Dale. 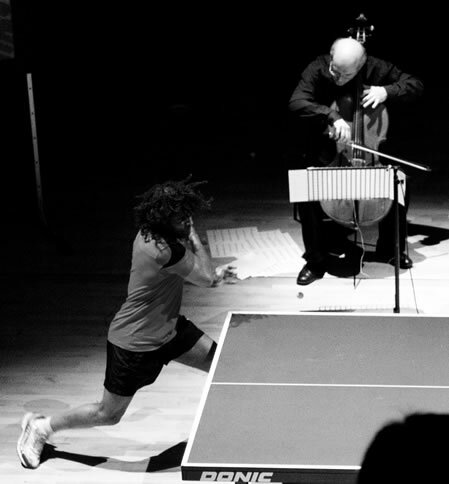 The work explores the strong and distinct sounds and rhythms that table tennis players can create, and it was performed at Warwick Arts Centre, A E Harris in Birmingham, at the HAKA Sports Complex in Bromley and broadcast on Radio 3 as part of the ‘Hear and Now’ series. Our partners in the project were the University of Warwick, Birmingham Conservatoire, Ping London and the Fusion Table Tennis Club, Bromley. New Music 20x12 was a UK wide programme which consisted of twenty outstanding new works, each lasting 12 minutes, which were commissioned to feature centre stage of the London 2012 Cultural Olympiad. Each commission was broadcast on BBC Radio 3 and toured the UK, enabling as many people as possible to enjoy excellent new music as part of our celebrations of the London 2012 Olympic and Paralympic Games. Click here to view the University of Warwick’s video article about Ping! PRS for Music Foundation’s New Music 20x12 is a UK-wide commissioning programme initiated by Jillian Barker and David Cohen, and delivered in partnership with the BBC, LOCOG, Sound and Music and NMC Recordings. See www.prsformusicfoundation.com for more information. Joe Cutler's music has been described as “propulsive” (BBC Music Magazine), “alluring” (Scotsman), “neurotic” (Re-Diffusion) and “the best thing to come out of Neasden since Twiggy” (Gramophone). His music has been performed in over 30 countries and on 6 continents including performances at venues such as Bang-on-a-Can Music Marathon (New York), Gaudeamus Music Week (Amsterdam), Opera City (Tokyo), Musik Monat (Basle). 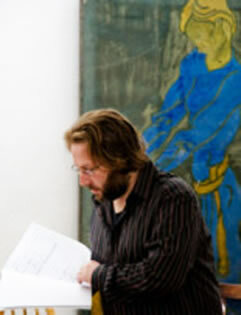 Since the late 1990s he has spent a considerable amount of time in the Netherlands, working with such groups and performers as Orkest de Ereprijs, Orkest de Volharding, Netherlands Wind Ensemble, Harry Sparnaay, Annelie de Man and Tomoko Mukaiyama, whilst in the UK he has worked particularly closely with Darragh Morgan, Mary Dullea, Robin Michael, Sarah Leonard and Noszferatu (an ensemble which he co-directs). In recent year he has also written a number of orchestral pieces and has worked recently with the London Symphony Orchestra, BBC Symphony Orchestra, BBC Concert Orchestra, Scottish Chamber Orchestra, Swedish Chamber Orchestra, The Orchestra of the Swan and the RTE National Symphony Orchestra. His has worked both in the concert hall and outside, working with visual artists such as Tom Dale, Jaap Drupsteen and Gary Ward and has written music for the National Theatre, London. 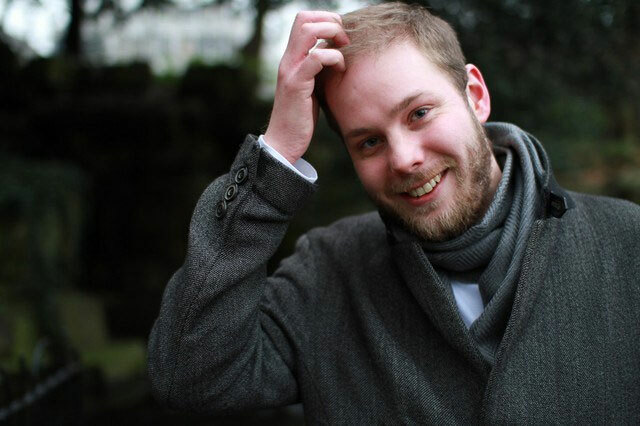 Since 2000 he has taught at Birmingham Conservatoire where he is currently Head of Composition. In June 2008 a portrait CD of his works was released on NMC and was one of Gramophone Magazine's Top 20 Releases of the Year. He also won the 2008 British Composer Award in the chamber music category for Folk Music, commissioned by the Smith Quartet. Ping! 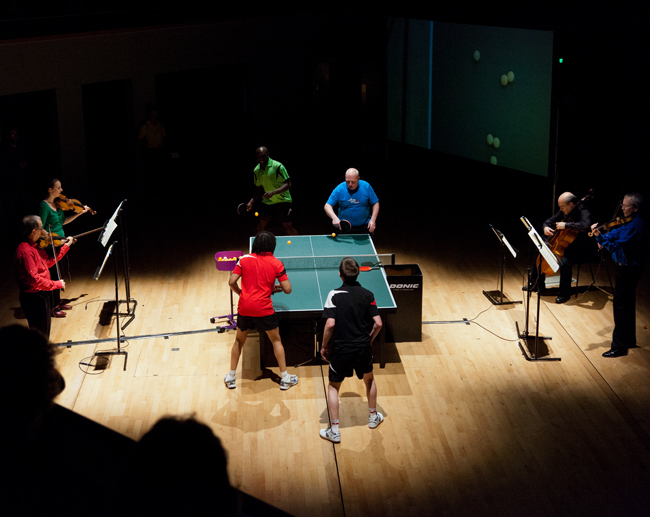 : Music vs. Table Tennis at Warwick Arts Centre on 3rd March was a huge success and we were thrilled that so many people came not only to see and hear the premiere of Ping!, but also to take part in all the amazing activities that took place at the Arts Centre that day. Ping! is high energy, high voltage music with virtuoso writing for string quartet which is well matched by the table tennis display that Fusion have choreographed for the work. In fact what is remarkable about Ping! is that it is a true collaboration between music and sport. Much of the table tennis play is timed to coincide with the music, and the Fusion players consistently matched their ensemble with that of the quartet! Joe Cutler has used all sorts of percussive effects and unusual instrumental techniques, with plenty of intricate rhythmic patterns, and the sounds of the table tennis are completely integrated into the music. Artist Tom Dale’s film installation, displayed on two large screens, added a fascinating and enigmatic extra dimension to the performance. The whole event almost filled the entire arts centre and lasted most of the day. Our intention was to surround the premiere performances of Ping! with sport-related music and table tennis so that people could immerse themselves in both and hopefully have a good time. It started early with a coach load of table tennis players from the Fusion Club turning up to play the first rounds of the table tennis tournaments in the Butterworth Hall, and the first ‘Musical Promenade’ that we had organised kicked off at 12.00. Paul McGrath and Lucy Griffiths from the University’s Music Centre led the first group of promenaders through the foyer to take part in Choral Ping Pong and to hear Elia Maramotti sampling ping pong sounds live on his computer. 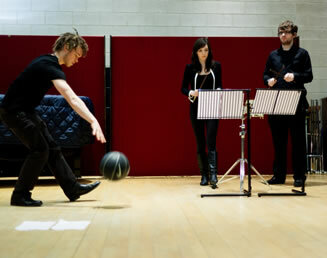 This was followed by students from Leeds College of Music performing Rebounds by Damien Harron, which is scored for two bongo players and two basketball players. 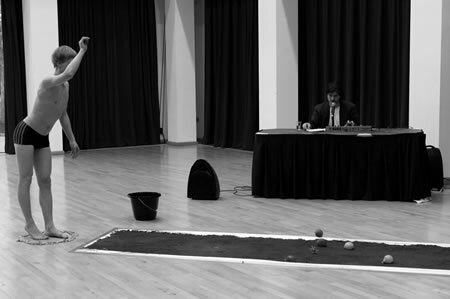 The performers, Tanya Pendred, Tung Chan, Jack Amblin and Michael Farthing, gave an exhilarating, perfectly synchronised performance that made you wonder why you had never thought of basketballs as percussion instruments before. In the meantime the University’s inspirational drumming and steel pan tutor Dave Barrett gave his first ‘turn up and have a go’ drum workshop. It was wonderful to hear the transformation he achieved with each group that turned up. Within half an hour he had created an intricate drumming and percussion piece that was hugely satisfying for those taking part, most of whom had never hit a drum in their lives. The audience was then led into the Butterworth Hall for the premiere performances of Ping! Clearly, people had no idea what to expect, but they were knocked out by the sheer spectacle of the work and the virtuoso table tennis playing! Each promenade then ended with a wonderfully surreal work of performance art in the Helen Martin Studio created by Ensemble Lös Cabarellos from the Netherlands. The group (Andy Ingamells, Ivan Babinchak Renqvist, Jeremiah Runnels and Belinda Lee) had devised a bizarre Dutch ’beach’ version of the French game of Pétanque involving a strip of sand-covered tarpaulin, water balloons and a horribly spiked marker ball that had to be avoided at all costs. The commentator’s description of the match - calm, matter of fact and quite mesmerising - became increasingly detached from the reality of the ‘game’ that we were watching, so that when Belinda appeared as a rather spectacular cheerleader, the audience were more than happy to be led by her into giving vociferous yet entirely neutral support to both players! As well as watching table tennis matches of a very high standard throughout the day, our audience could also challenge a table tennis robot, play Wii table tennis computer games, watch table tennis DVDs and create colourful badges out of ping pong balls. Overall, the event was as far removed from a ‘traditional’ classical concert as it is possible to imagine and, for us, it was just enormous fun. 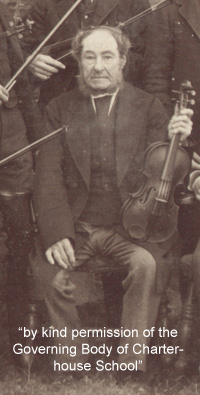 Dublin born composer Seán Clancy’s (b. 1984) music has been described as exploring the tensions between found and original material, narrative and rupture, elite and vernacular values, and between innovation and intervention. His music has been performed and broadcast internationally by many of the worlds leading artists and ensembles and has featured at numerous international festivals of new music. Awards include an RTÉ Lyric FM/IMRO Composition Bursary (2012), selection for the UNESCO International Rostrum of Composers (2011) and BCMG/SAM Apprentice Composer in Residence (2011). Now a tutor at Birmingham Conservatoire, Principal teachers in the past have included David Lang, Joe Cutler, Howard Skempton and Gerald Barry. 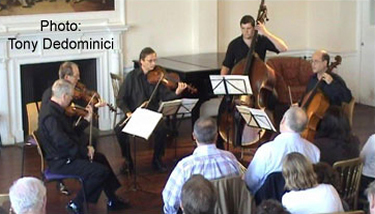 He is represented by the Contemporary Music Centre, Dublin. The Leamington born composer Robert Simpson died in 1997 but will not be forgotten in Leamington, when on Friday 17 June 2010, a blue plaque was put on the house in Rosefield Street where he was born. Angela Simpson his widow attended the ceremony, along with his sister, Mim. The initiative came from the Leamington Blue Plaque Committee and the ceremony was followed by a reception at Leamington Town Hall. A further plaque was unveiled on the same afternoon, for the actor Norman Painting, known principally through his many years in The Archers. Leamington Music was very much involved with the event and co-promoted a concert with the nearby Royal Spa Centre that evening, featuring the Coull String Quartet, which had a close association with the composer. Robert Simpson wrote eleven symphonies and fifteen string quartets, which for the second half of the twentieth century, remains an unusual achievement. His parents had been in the Salvation Army, so he also became well known in the brass band world. Simpson was equally prolific as a writer and as a celebrated producer on Radio 3, championing a range of composers from Haydn and Beethoven to Bruckner, Sibelius and Nielsen, who he almost single-handedly introduced into England. He provided much pleasure to listeners with his programme The Innocent Ear, but he eventually resigned from the BBC, disillusioned with its policies. He was also a notable campaigner for peace. The concert on 17 June took place in the Studio Theatre of the Royal Spa Centre at 7 30. The Coull Quartet played Haydn’s Quartet in C Op 33 No 3 ‘The Bird’ and Beethoven’s ‘Razumovsky’ Quartet in E minor Op 59 No 2, with Robert Simpson’s Quartet No 7, written in 1977 to celebrate the centenary of the birth of the astronomer Sir James Jeans. Simpson was a keen amateur astronomer. The Coull Quartet first met Robert Simpson in the late 70’s, in his role as senior music producer for the BBC Radio 3, when they recorded music by Brahms and Rubbra. Shortly afterwards they were invited to illustrate some of Simpson’s public lectures on Beethoven’s chamber music and they also began to explore his own string quartets. 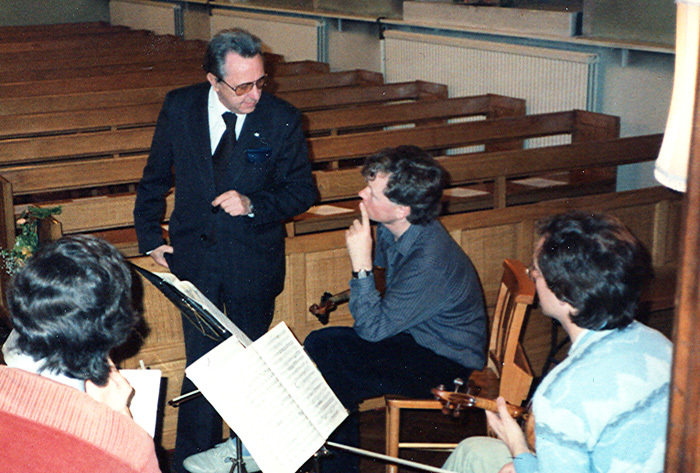 Their relationship with the composer blossomed throughout the 80’s and in 1984, the University of Warwick commissioned his tenth string quartet, on the occasion of the Coull’s tenth anniversary. They also gave the world premieres of the eleventh and twelfth quartets and his viola quintet, subsequently recording these works for Hyperion Records. The Coull Quartet regularly features Simpson’s quartets in its concert programmes, and his traditional yet highly distinctive voice has fascinated and impressed audiences and critics alike in the UK, Europe and America. The concert on 17 June was supported by the Robert Simpson Society, Leamington Town Council and a private donation. Leamington Music is financially supported by Warwick District Council and Leamington Town Council, many sponsors, trusts and individual donors. Philip Gallaway writes about the Coull Quartet's friendship with a remarkable, yet unassuming composer. We worked closely with Bob Simpson over a period of several years. We first met him when he was a BBC producer in the 70s, when we made a studio recording of Brahms and Edmund Rubbra, who he felt had been unfairly neglected. Subsequently we illustrated some talks he gave on quartets by Beethoven, Tippett and others. His modesty prevented him from telling us about his own quartets - we learned of those from someone else! When prompted, he suggested we should try his 7th first - a work of which he was especially fond, and which was dedicated to the astronomer Sir James Jeans (Bob was also a keen astronomer). The work is in three main sections; a fast, intense central section framed by two quiet slow ones, rather like, in Bob’s words, someone viewing the Earth from the silence of outer space, then moving gradually closer, so that all the hectic activity and noise on the surface of the planet is revealed in detail before returning to the quietness of space. We enjoyed this work so much that we commissioned his 10th for our 10th anniversary in 1984, with funding from West Midlands Arts and the University of Warwick. The 11th was commissioned for us by our friend Mike George, another BBC producer. The 12th we also commissioned, and we gave the first performance of the Viola Quintet, although this was the result of a BBC commission for another group who had disbanded. Bob was very helpful and encouraging to us, and always gave down to earth advice. I once asked him how to phrase a fortissimo melody which had accents on every note. 'Just sock every note on the bloody nose' was his reply! He wasn't keen on over-use of vibrato or sentimental portamenti. When we first worked on the 11th quartet we were very concerned we wouldn't be able to play it at the metronome mark he had indicated. When Bob came to one of our final rehearsals before the first performance he admitted, much to our relief, that he’d got it slightly wrong, and had intended a much weightier character, so he reduced the metronome mark accordingly. He said that he wasn't the first composer to make this mistake - singing something in your head often results in a faster mark than the one you arrive at when actually playing it. Perhaps good advice when dealing with some of Beethoven's metronome marks! He was very insistent that we should achieve the exact tempo relationships between the movements in this work, his intention being that the listener wouldn't immediately be able to tell where one movement moved to the next. He said the last movement should sound bleak and deathly, like the aftermath of a nuclear holocaust. Quiet, but not peaceful. The 11th quartet is the one we performed most, though I am especially fond of the 10th. In the third movement, Bob said he was trying to define ‘peace’, but he always maintained this wasn't meant to be a political statement (though he was a life-long pacifist). This wonderful portrayal of calmness and serenity was the music my wife chose to listen to while giving birth to our first son in 1988. Both the 10th and 11th were almost invariably well reviewed in the press, even by critics who felt Simpson’s music was a bit 'old-fashioned'. The New York Times critic was especially complimentary about the work when we played it at the Frick Collection, later selecting our recording as one of his ‘CDs of the Year’. The 12th Quartet is a slightly tougher proposition to perform and listen to, as it consists of two very long movements, which are rather challenging to sustain, whilst the Quintet with extra viola is a wonderful work which deserves far more performances than we’ve so far been able to give it! 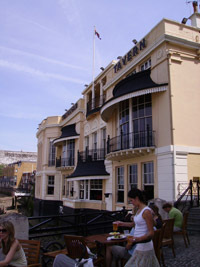 On Sunday 21st September 2008 we presented an unusual, if not unique concert, at the Trafalgar Tavern by the Thames at Greenwich, that was the culmination of the first stage of our collaboration with the music historian Dr Christina Bashford, Trinity College of Music and the Meantime Brewing Company. We recreated an event originally promoted by the violinist Joseph Dando on 17th January 1838 at the London Tavern in Bishopsgate, so that we could illustrate the historical connection between classical music and pubs. As far as we know, Dando’s tavern concerts were the first public events dedicated solely to chamber music, and they would have attracted a broad cross-section of the professional and merchant classes for whom taverns were the natural and obvious places to meet for business and social occasions. Dr Bashford gave a fascinating pre-concert talk whilst beer historian Peter Haydon gave a short introduction to the development of London ales and taverns between items in the first half of the concert. To add to the historic atmosphere, the audience were able to sample historically authentic ales provided by the Meantime Brewing Company. The contribution of five students from Trinity College of Music was much appreciated. We thoroughly enjoyed working with Victoria Rawlins (viola) and David Hnyda (double bass) who joined us for the Spohr Viola Quintet and Onslow Bass Quintet, whilst the Greenwich Piano Trio gave us all a much needed break in the colossal programme with an exciting performance of Beethoven’s early E flat Trio. The concert was an incredibly interesting experience for us as performers, and the Spohr and Onslow Quintets gave the programme a very distinct flavour. 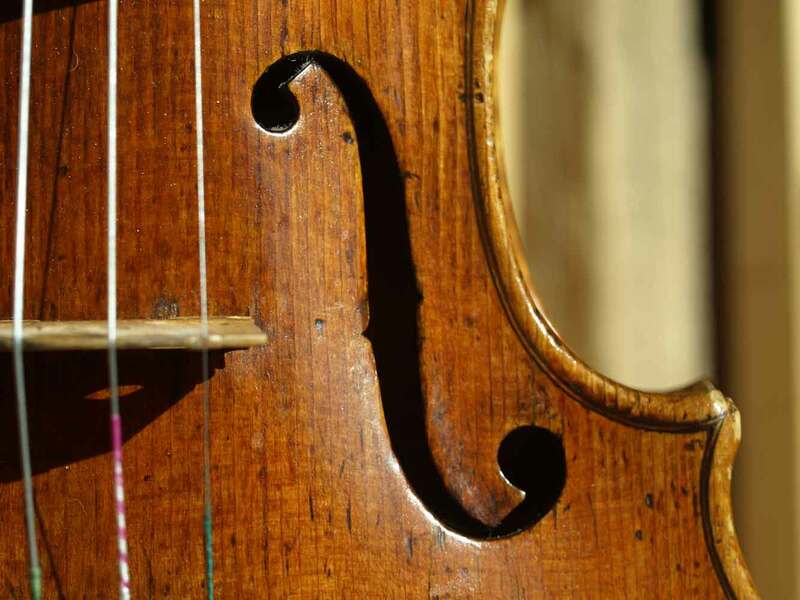 We felt that both works, particularly the Spohr, were of high quality and enjoyable to play, but very much of their time: melodramatic with florid, virtuosic writing, especially for the first violin. Set alongside the Haydn and Beethoven it is clear why they have not become part of the canon of chamber music (although they were enormously popular in the mid-19th Century), as their musical language is so unmistakably ‘Victorian’ and just didn’t ‘translate’ to the 20th Century, let alone the 21st. We do believe that they are still well worth hearing, though, and we are looking for further opportunities to present works by these unjustly neglected composers. Having made a connection with history, and explored our ‘roots’ as chamber musicians, the next stage of this project will try to place it all in a 21st century context. We feel that there is no reason why live chamber music cannot be enjoyed in a relaxed setting more like a jazz concert, with the audience seated at tables with food and drink, free to come and go between movements, and are currently working with the Meantime Brewing Company to find other suitable venues in London and elsewhere where we can present informal ‘tavern’ concerts. We hope to be able to announce some more concerts very soon. We are very grateful to the John S Cohen Foundation, the Golsoncott Foundation, the Garfield Weston Foundation and Emma Davidson for the generous financial support they have given to this project. 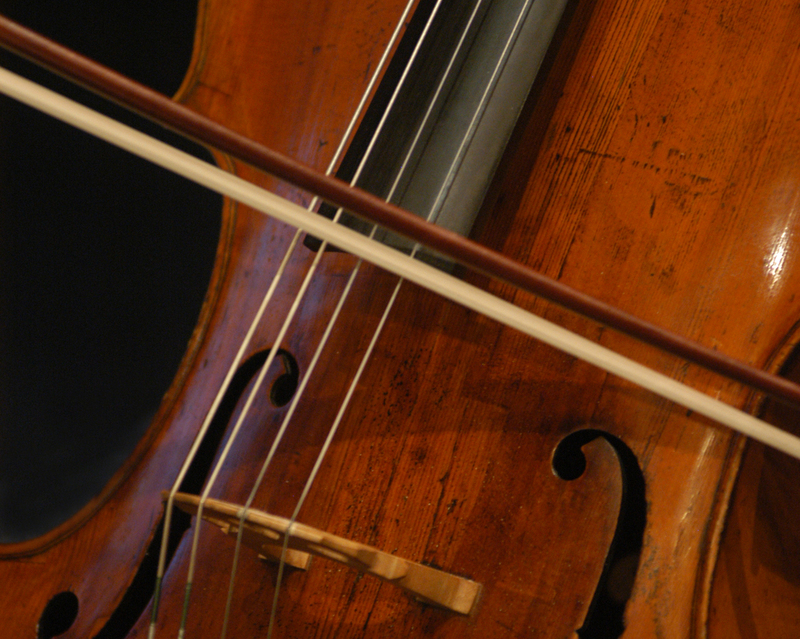 “Chamber music concerts - in venues such as the Wigmore Hall and the Purcell Room - are something we take for granted in London today. But their origins are both little known and surprising. For unlike Vienna, where string quartet concerts started c.1805 in the palace of Beethoven’s patron Count Razumovsky, London’s chamber music culture began thirty years later, and in a seemingly unlikely location: the taverns of the City district. The City was an area synonymous with finance, commerce and self-made wealth, and some of its taverns served as meeting-places for businessmen, or hosted important social functions, including banquets. They also held concerts. As such, these buildings were a long way from the dingy drinking pub that the word ‘tavern’ conjures up in the modern imagination. The City chamber music concerts were spearheaded by the violinist Joseph Dando, who began his venture in the Horn Tavern, in the shadow of St Paul’s Cathedral, in 1835-6. He later moved the concerts to the London Tavern (on the west side of Bishopsgate), which boasted a fine upstairs saloon that was used for music. 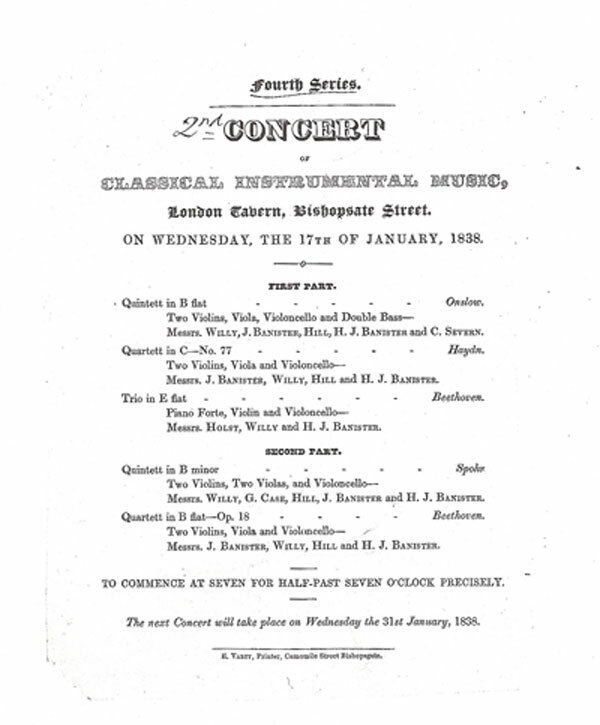 Today’s performance reconstructs a concert given at the London Tavern in January 1838 (the printed programme for the actual event is preserved in the Royal College of Music Centre for Performance History), and includes a rarely-played quintet with double bass by Georges Onslow and a two-viola quintet by Louis Spohr, alongside more familiar works by Haydn and Beethoven. The long programme is fairly typical for the time, but it differs strikingly from what went on in concerts in the more fashionable West End, in that it eschews vocal numbers and concentrates exclusively on instrumental repertoire. The City was, even at this time, home to many serious classical music-lovers. Certificate in Teaching in Higher Education, Oxford Brookes University; BA, University of Oxford; MMus and PhD, King's College, University of London. Christina Bashford's main research interests are in performance history and the social and economic history of music. Her focus to date has been on musical culture in 19th- and early 20th-century Britain, particularly London, and this has resulted in a range of work on chamber music, concert institutions, audiences, program notes and listening practices. 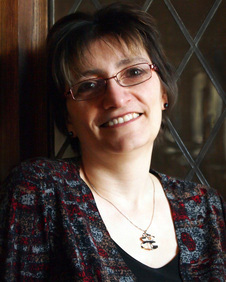 She has published articles and reviews in Music & Letters (winner, Jack Westrup Prize, 1991), the Journal of the Royal Musical Association, the Journal of Victorian Culture, Musical Quarterly, Notes, the Journal of the American Musicological Society, and Eighteenth-Century Music, and has contributed to several volumes of essays, including The Cambridge Companion to the String Quartet (2003) and The Musical Voyager: Berlioz in Europe (2007). Her book, The Pursuit of High Culture: John Ella and Chamber Music in Victorian London, was published by the Boydell Press in 2007. She also co-edited, with Leanne Langley, Music and British Culture, 1785-1914: Essays in Honour of Cyril Ehrlich (Oxford University Press, 2000). Prior to coming to Urbana-Champaign, Dr Bashford was on the faculty of Oxford Brookes University in England; before that she served as the Managing Editor of The New Grove Dictionary of Opera. She is also a collaborator on the Concert Life in 19th-century London Database, a research project founded in 1997 with colleagues at the University of Leeds and Goldsmiths College, London. Now an active member of the North American British Music Studies Association, she hosted the society's fifth biennial conference here in July 2012. Her current work includes a project on violin culture in Britain and beyond, 1880-1930; she has recently published a preliminary essay on the British violin press in Music and Peformance Culture: Essays in Honour of Nicholas Temperley (2012).